Happy Bloggers Challenge Friday! Thanks to those who played along with the Holiday Gift Packaging Challenge, the challenge this week is Holiday Cards (any holiday). I was late in getting out my cards this year, the flu bug hit our house and I lost a week of getting things done. So last minute Lucy here was still sending out cards just days before Christmas! The card I designed was in need of "tiny" bows to adorn the die cut reindeer, so I had to get creative as I had a ton to tie. Thank goodness for the scrap of foam and toothpicks! My makeshift bow maker worked out great! 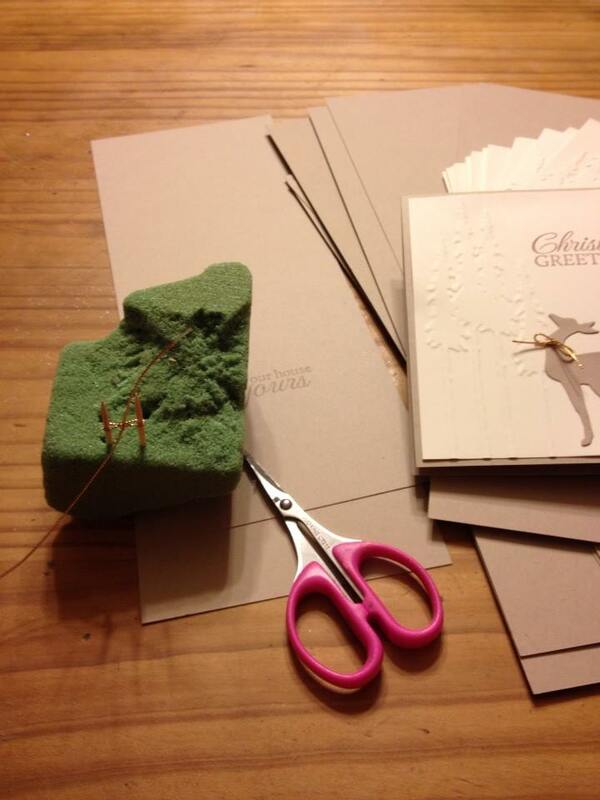 I was also able to emboss four piece of card stock at one time and die cut six reindeer, so that was a time saver! If you'd like to play along with this weeks Bloggers Challenge, please link back to this post on your blog and mention you created your card for the Bloggers Challenge Holiday Cards Challenge. Please add your link using the Link Tool below, your link should be a direct link to your Bloggers Challenge Post, use your name as the Title. Please do not link to cards that were created prior to the challenge date. Entries not linking properly, or backlinked will be removed. If you have the captcha enabled on your blog, please consider turning it off, as it makes it so much easier to leave comments. Your Christmas cards were awesome and hope you had a Merry Christmas! Glad you all are feeling better. Hope you had a wonderful holiday, Lisa! Love the makeshift bow maker--what a great idea!